That same year, he painted “Young Peasant Girl Having Cafe au Lait” (1881) [PDRS 662], a study in the optical mixing of colors and reflections. The blue-green on the wall behind her is reflected on the shoulder and sleeve of her pink blouse in tiny dots. Her dark blue skirt is reflected on the front of her blouse, and the pink of her long sleeve is reflected in the skirt at the bottom of the canvas. The brushstrokes are tiny and many are criss-crossed. All of this happened in 1881, four years before Pissarro met Seurat, years before pointillism became a painting technique, and well before the word, Neo-Impressionism was invented by art critic Félix Fénéon. Though he graciously gave Seurat all the credit for “inventing” the new scientific technique of painting, he had been experimenting with it years before! * Rood, O. N. (1879). Modern Chromatics. London, C. Kegan Paul & Co., 279-80. The Pissarro exhibition at the Musée Luxembourg in Paris is totally different from the one at the Marmottan. “Pissarro in Éragny” focuses only on the paintings the artist did in the last two decades of his life at his rural home on the edge of Normandy. Pissarro had lived in Pontoise for many years, but it became too expensive for his large family. 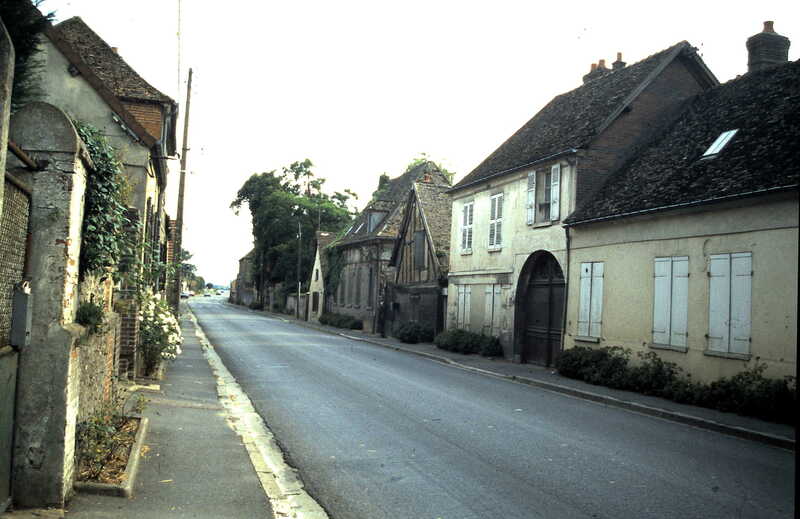 After a long search, he found a big house on a generous plot of land in the tiny village of Éragny (it is still a tiny village, but now has one stop light to slow the large trucks who used to speed through the main street). Eventually, Pissarro and his wife Julie bought the house, and he transformed the large barn into a studio. Many of the paintings in this exhibition were made from one of the windows in this studio. This is the only group of Pissarro’s works that had not been studied before now. The narrow focus of these paintings displays the genius of Pissarro in that he could look at scenes so familiar and still see new visions. When Pissarro moved to Éragny in 1884, he did not know Seurat and had not yet begun his experiments with Pointillism. But he had been studying the books of color written by Chevreul and the American Ogden Rood. His paintings show that he was already practicing a form of color division. In “La Maison Delafolie a Éragny, Soleil Couchant (1885). he uses several different colors to depict the haystack and the side of the building, as well as the patch of grass and the road. After learning how Seurat had formalized color division into a system called Pointillism, Pissarro enthusiastically began experimenting with the technique. In “Paysannes Ramassant des Herbs, Éragny,” (1886) he uses thousands of tiny dots, placing contrasting colors side by side—colors that would mix in the viewer’s eye to produce the desired hue. This particular painting is interesting in that Pissarro uses the fields and the lines of trees to outline the geometric aspects on the canvas. The lines and angles contrast with the curves and puffiness of the clouds in the sky. In “Gelée Blanche, Jeune Paysanne Faisant de Feu” (1888), Pissarro shows just how much can be done with the tiny dots, especially in the fire and smoke as they blend together to create color and form. After a few years, Pissarro abandoned Pointillism because it took so long to produce a finished work and because he missed the spontaneity of his earlier style of painting. Instead, he developed a larger brushstroke which he frequently produced in a series of cross-hatches, but he retained the color division that he had developed before his experiments with Pointillism. Pissarro used the passing seasons and the weather to create new views of the land around Éragny. In “Effet de neige a Éragny” (1894), he allows the snow to define the geometric outline of the meadow. The crooked fence and line of trees make diagonals from the left corner and form angles with the horizontal fence and line of trees. In the muted colors of late autumn, he uses light orange to emphasize the angle. The droopy tree on the right lends some curves to what is otherwise a study in lines. 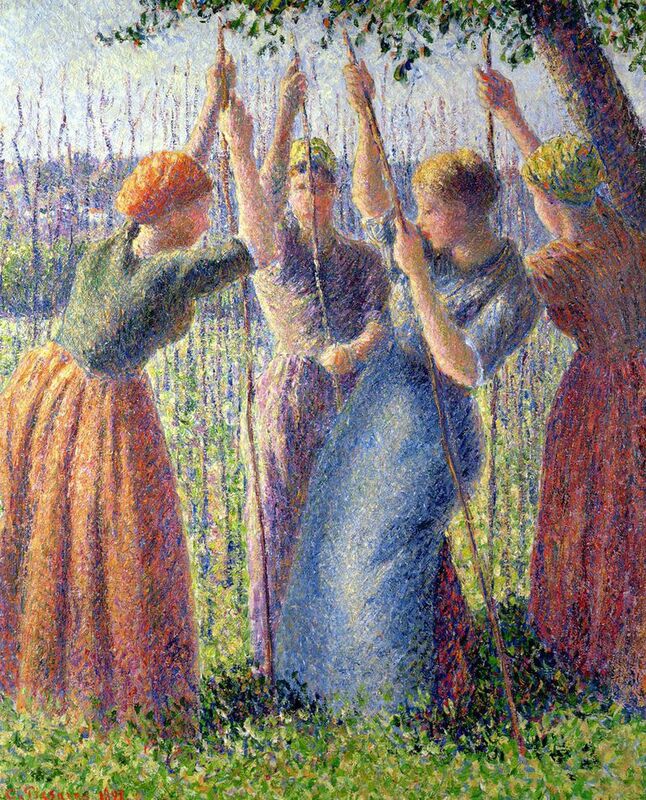 In one of my personal favorites of the entire exhibition, “Femmes Dans un Clos, Printemps, Temps Gris, Eragny” (1895) Pissarro layers two of his favorite techniques. In the very back is a line of trees forming a screen. Over it he places the curvy limbs of a blooming fruit tree which adds another screen to the existing trees. In the foreground, he places rows of plowed earth in straight lines, which are mirrored right above them by the straight fence rows. The composition is so complex and so interesting that you almost fail to see the two women working in the field on the right. This exhibition on Pissarro’s Érany paintings provides a clearer understanding of his passage through Pointillism to a new way of painting that allowed him to express his own “sensations” and create new ways of looking at paint on canvas. The exhibition runs until July 23. Pissarro painted The Dieppe Railway in 1886, following the Eighth Impressionist Exhibition in which he showed his Pointillist works. You have to look closely to even see the train, just to left of the canvas center. The train itself is not important—it is simply there as a reference point in a composition of geometric shapes and color blocks. In many of his paintings, Pissarro used sketchy trees and figures to make what are essentially abstract compositions look more like familiar scenes. While the actual location of this painting is not important, I believe this scene was near the Éragny railroad station just across the highway from his home. This current photograph shows the railroad track, the contours of the fields, and the same blue hills in the distance. We usually expect a painting to show something important or at least something pretty, but there is not much distinctive about this particular space. Rather than a typical subject, Pissarro chose these oddly-shaped color fields. In the large foreground, he created a golden field with points of color, ranging from light yellow to gold, coral to red, and a bit of light green. To the right is an odd shape composed of green and dark blue spots, flecked with a little gold. It is obviously a shadow but we do not know its origin (possibly the old train station that is no longer there but appears in historic postcards). The green fields in the distance, made of light and dark green dots, are edged with golden fields of the same intensity as the foreground. Even the distant hills are blue dots of different shades mixed with ivory flecks. The cloudy sky absorbs the ivory points and mixes them with dots of yellow and coral. Above the clouds, light blue dots fill the top of the canvas with blue. 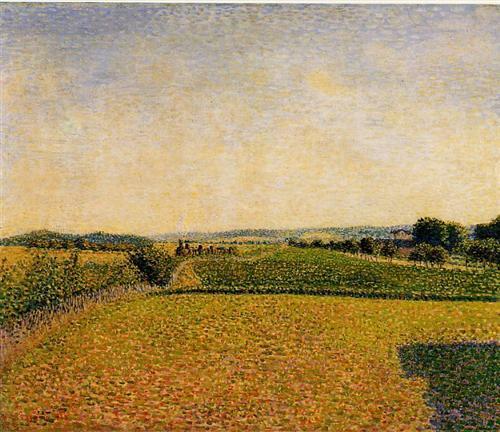 Pissarro must have made this painting as a showcase for Pointillism and fields of color. The composition and use of paint are far more important than the picture of the train. When we look at this painting today, we can say it is virtually abstract—Pissarro couldn’t do that. In 1886, the word abstract had not yet been used in relation to art. This painting, “Peasant Women Planting Poles into the Ground,” (1891) was made during those few years that Pissarro used the pointillist technique. Right now, it can be seen as part of an exhibition on Neo-Impressionists at the Phillips Collection in Washington, DC. Its last appearance in the US was in 1995 in New York at an exhibition curated by Joachim Pissarro, the artist’s great-grandson. Pissarro was intrigued with pointillism because it used scientific methods to create art. As you know, this technique is created by putting dabs or spots of pure color side-by-side to create light or shadow. When you look at the painting, your eyes automatically mix the dots. This is the opposite of mixing colors on the palette. You can see the same effect in digital photographs. If you zoom in close enough, you can actually see the little squares of different colors that make up the images in the photo. The Impressionists had perfected the practice of painting en plein air, often completing a picture in a single day. However, pointillism with its myriad details required advance planning. To make this painting, Pissarro did several drawings to finalize the composition. In fact, he went back to a previous fan-shaped gouache from the previous year (1890) for the motif. The fan shows women putting poles in the ground to support the young pea plants. The composition is spacious, showing surrounding fields on each side and there is room between each of the women. In contrast, the composition of this painting is much more dramatic. Pissarro cropped away all the surrounding fields and moved the women closer together. He also changed the positions of the women to emphasize the motion of their bodies. You can feel the rhythmic pounding of their actions. His skill in the pointillism technique is evident as you examine the individual brushstrokes of each part of the painting. Look at the skirts of the women. The orange skirt on the left gets its shade from a combination of orange, dark blue, and yellow or white dots. The dark red dress on the right includes deep blue or purple dots along with red and yellow dots. The blue skirt gets its color from dots of purple and white. The use of different colors in tiny brushstrokes gives the colors an intensity and brightness that they do not have when mixed on the palette. After a few years Pissarro grew tired of the pointillist technique. It took a lot longer to make a picture, and his output during those few years is much less than was normal for him. He abandoned the full technique and went back to his more spontaneous way of creating paintings, but he kept elements of pointillism in his paintings for the rest of his life. This wonderful view of the village of Éragny is in the collection of the Birmingham Museum of Art, Birmingham, Alabama. Recently, I had an opportunity to see the painting in person and study it closely. You would be deceived if you think this is simply a lovely landscape. Like so many of Pissarro’s paintings, there is a lot more to it than that. Camille Pissarro and his family had just moved to Éragny in April of 1884. Delighted with new topographical subjects, he painted through the snowy winter. When he made this panoramic landscape in the early spring of 1885, he seemed to be taking the measurements of this new location. The current photo of Éragny (below) shows that it has changed little since he lived there. To get the view in the painting, Pissarro crossed the road (now Rue Camille Pissarro) in front of his house and walked beyond the houses on the other side to look back at the village. All the local landmarks are visible. In the center of the painting, the steeple of the church at Éragny pierces the sky. The current photograph below shows that the steeple is quite high, especially for a church that small (the two sections in front of the steeple are recent additions). It appears that Pissarro gave the steeple in his painting some added height, perhaps to take it above the row of trees in the background and make it easier for us to see. 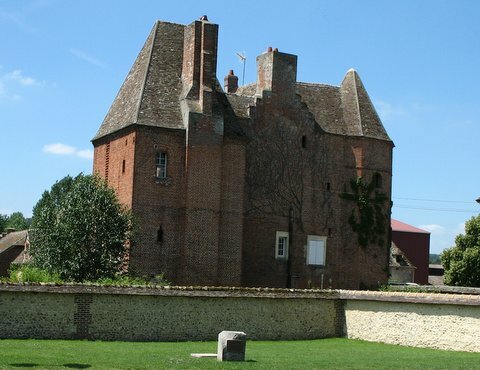 To the left are the towers of the large manor house which dates from the sixteenth century and was built for the lord of Éragny (see the current photograph below). This painting is one of those by Pissarro that can be viewed at many levels. The very casual observer might barely slow down, labeling it as a pleasant picture of a peaceful village. Others might do as we just did, examine the picture for landmarks and try to feel a sense of the village and the bare fields pictured there. But there is so much more to see. 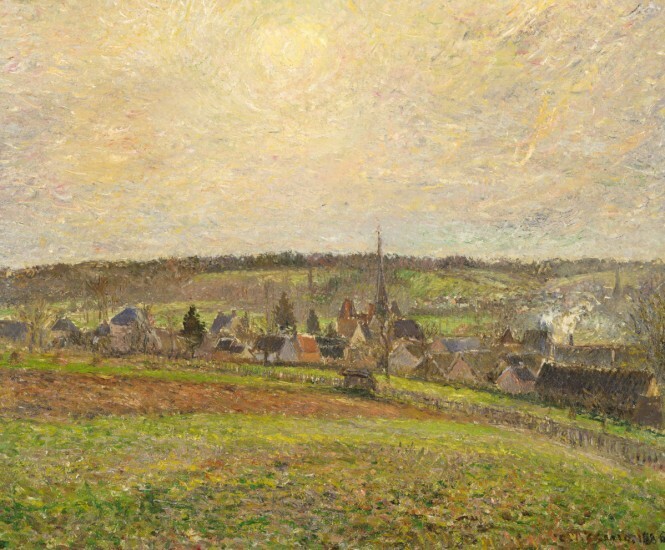 Pissarro saw the “skeleton” of the view and responded with what look like broad swaths of color in the foreground. Near the bottom, a darker area, then a lighter green strip, and a reddish section, which could have been newly-plowed ground preparing for spring planting. It leads our eyes on the right to the small wooden fence which stretches across the width of the canvas. The regularity of the horizontal lines is then interrupted by the jumble of houses lining both sides of the main street. 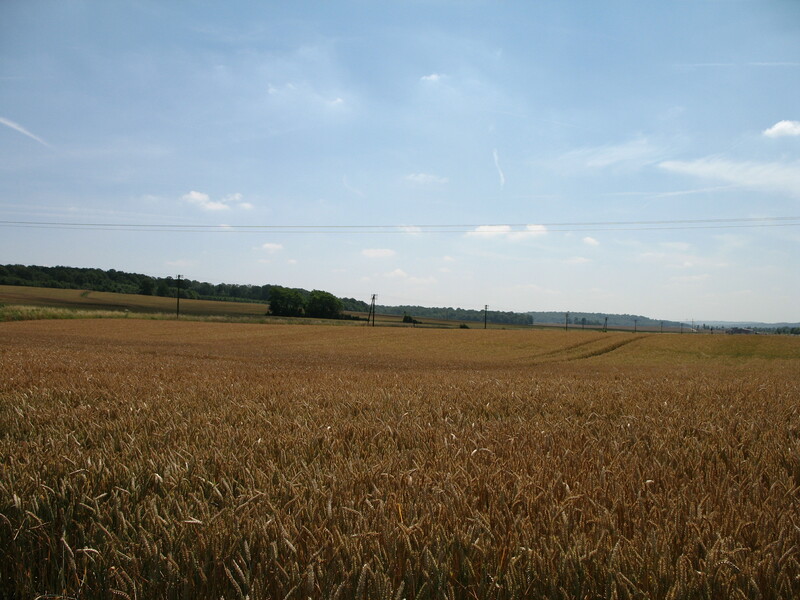 Except for Bazincourt in the distant middle ground, there are fields leading to the horizon lined with tree tops. What Pissarro does within these designated spaces is the most interesting of all and can easily be seen in the dark area at the bottom. He achieves the color and texture by placing small patches of color side by side, varying the mix to make it darker or lighter. This looks like pointillism, and in fact Pissarro had come to his own interpretation of pointillism before ever meeting Georges Seurat. For years, he had been interested in the division of color and had been reading the scientific writings of Michel Eugène Chevruel and Ogden Rood, an American scientist. When he met Seurat a few months after making this painting, he was excited to find someone else who shared his interest in color. This is just another example of how Pissarro was always ahead of his time, pushing forward, investigating, experimenting, innovating. In fact, if you mentally eliminate the village from this painting, it would almost look abstract. The Musée d’Orsay recently opened a mini-exhibition of Camille Pissarro landscapes and drawings in Chamber 69 on the second floor just above the sculptures. The room includes four oil paintings and six small gauches, watercolors and drawings. Three of the paintings are seldom seen in Pissarro exhibitions. These works combined with the nearly 20 paintings hanging in the Impressionist gallery provide a wealth of Pissarro works on view. Most outstanding of the paintings is a large masterwork depicting the Lavoir of Bazincourt. Bazincourt, a small village across the Epte River from Eragny, is seen in many of Pissarro’s later paintings. This painting is breathtakingly beautiful in person. Photographs are a very poor reflection of the painting’s luminosity. 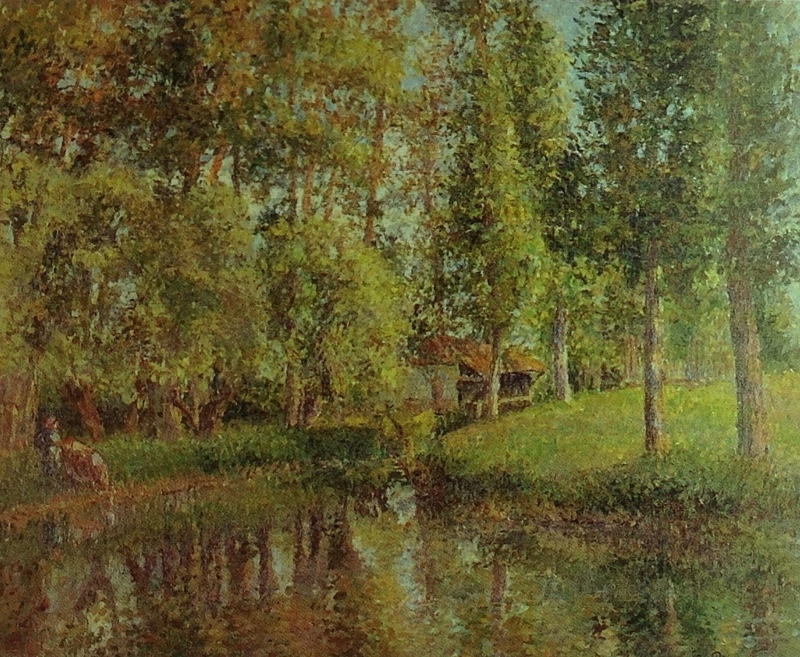 Pissarro made this painting in 1900 during a midsummer day. The trees are full of leaves, a rich bright green. The lavoir is almost in the center of the painting, and in the foreground is the clear water of the little river. The deep green shadows of the trees draw you into the painting, and you almost feel the cool breeze creating the ripples in the water. The influence of pointillism is clear in this painting with Pissarro’s many small brushstrokes, mere touches of color to the canvas. 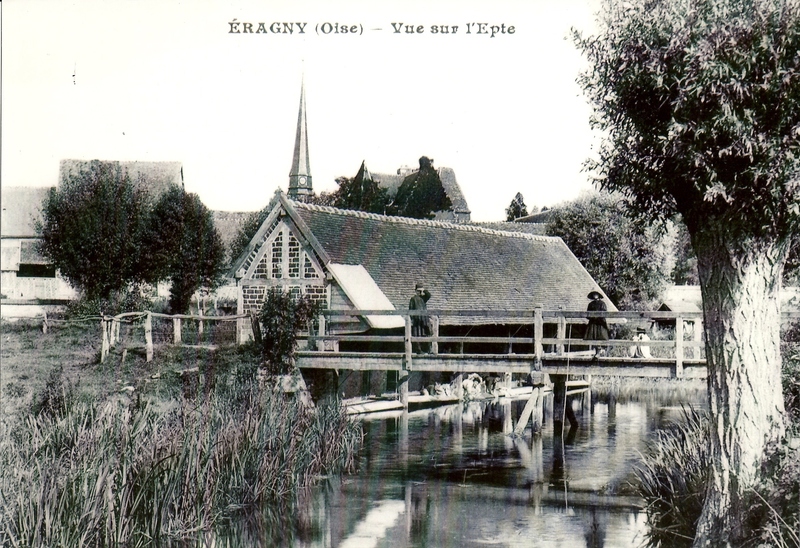 This old postcard shows a close-up view of a different lavoir on the Eragny side of the Epte River. In the 19th century, women washed their laundry in the small river, and these sheds (lavoirs) provided some shelter for this task. 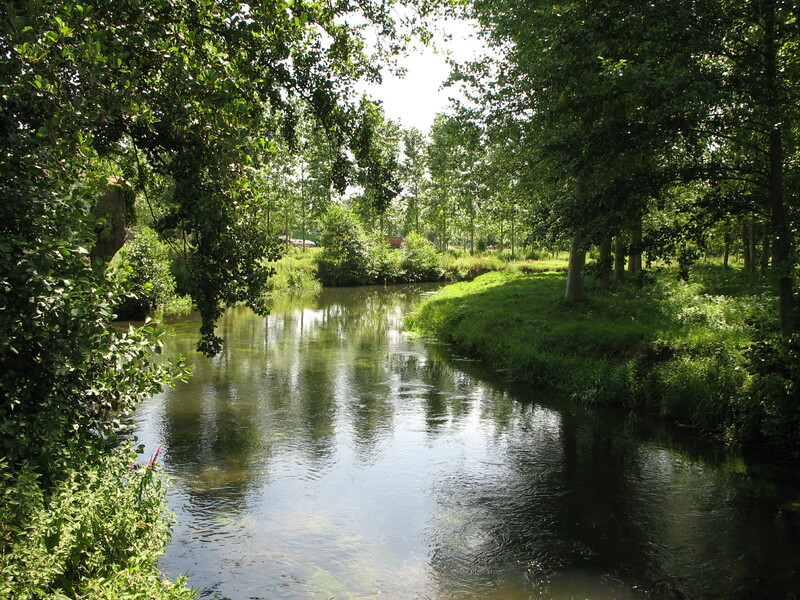 Many lavoirs have been preserved throughout Normandy, including one on the Epte River at Giverny. I cannot resist sharing my favorite photo of the Epte River, actually taken from a newer bridge Eragny, which shows how beautiful this part of the river is. The water is still as clear and cool (probably clearer since no one does laundry in it anymore). This is not the same view as Pissarro’s painting, but it portrays the same feeling. If you find yourself in Paris, be sure to see all the Pissarro paintings in the Impressionist galleries at the Orsay and search out the small Pissarro exhibition in the PostImpressionist section. Special thanks to the person from Italy who read ten or more posts to this blog the other day. It is so interesting to see that Pissarro’s fans are all over the world. If you would like to respond to this blog, please feel free to email me. Emails will be kept confidential. PISSARRO’S PLACES, the book about the locations where Pissarro made his greatest paintings is still available on amazon.com and at the book’s website: www.pissarrosplaces.com. Those who visit the website can receive a special reader’s discount.